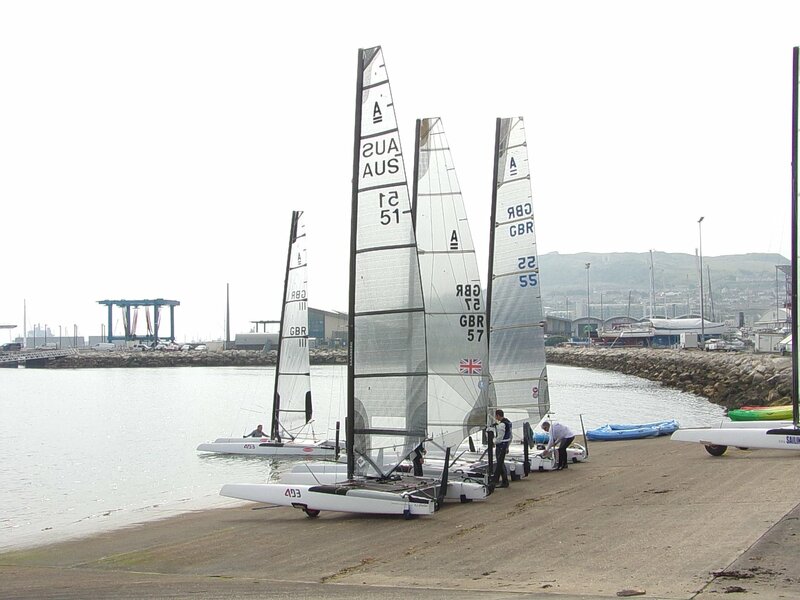 The 2012 British Olympics, and the 2019 venue of the Weymouth & Portland National Sailing Academy (WPNSA) was the location chosen for this year’s UK National Championships. This was done for a couple of reasons. 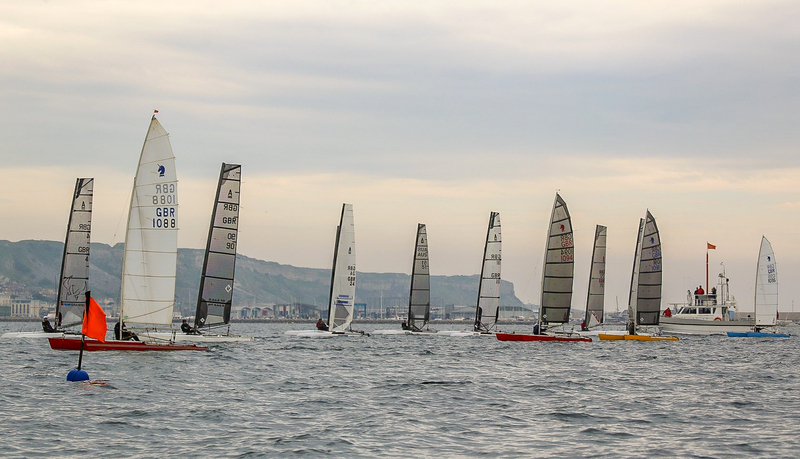 Firstly to give sailors a last chance to race at the venue before the ‘A’ Class World Championships are held there in August next year. 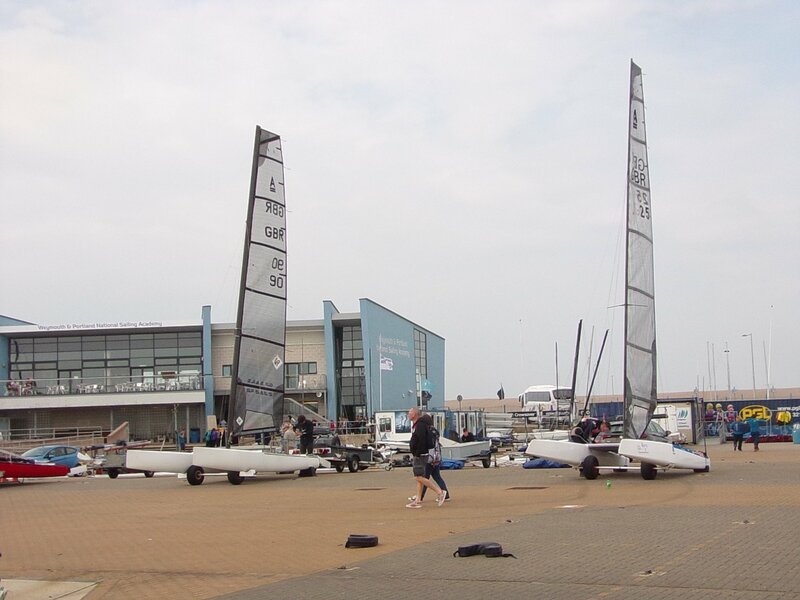 And secondly, to give the WPNSA an opportunity to see the ‘A’ Cats in actual racing action, allowing them to calibrate lap times/distances etc and give the shore crews an idea of what is to be required of them for next year. 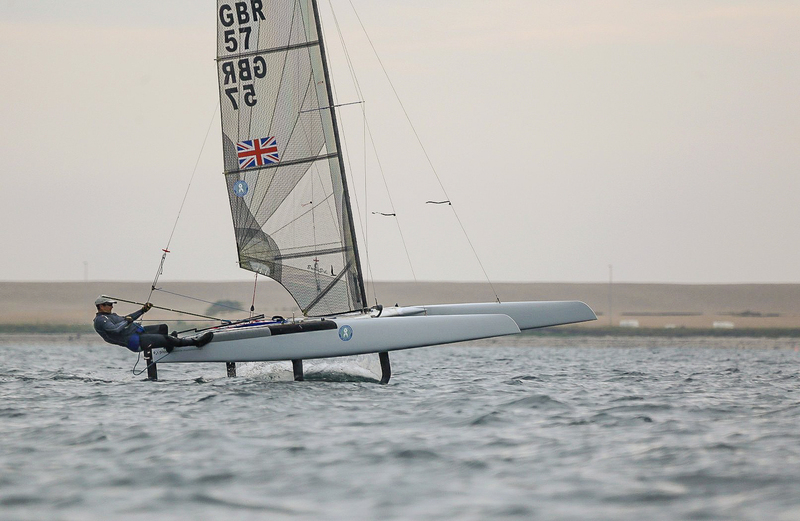 As the home of the British Sailing Team, who are out training in squads every day and being a popular venue for regattas, in all respects their systems worked perfectly as their organization, a legacy from the Olympics, is still very much functioning correctly. However, this year, as a result of a large high-pressure system sat over the Atlantic, the winds were a little peculiar of late, and tended to be Southerly or South-Easterly, rather than the usual South-Westerly, and tended to be stronger in the mornings, dropping off in the afternoons. This gave an interesting range of conditions to test the fleet. They are usually a little higher than you see on most forecasts too. This year attendance was somewhat diminished due to clashes with Texel and various other commitments suffered by BACCA members, leaving only 12 boats to race, plus some Unicorns, invited along to play too. 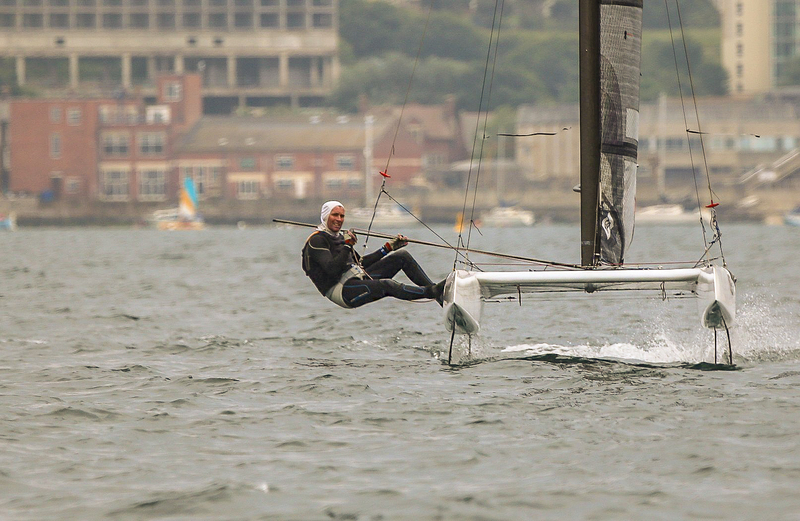 Racing together on one start, both Foiling and Classic divisions found the racing both good and challenging. When the wind is from that direction, Portland Harbour tends to have better winds than out in Weymouth Bay. Steady smooth winds over flat water made for excellent foiling conditions and allowed the Classics to ‘Wild Thing’ downwind for minutes at a time. The first two days saw 3 races each day, with the first two on each day in 10-13 kts, the third races of the day in more marginal 6-8kts winds. The last day had SE winds of about 9 kts initially, but dropping and was 5kts during the last race. Rather frustrating for some, but right in the zone for others. From the start, Artemis AC team member, former GBR Tornado Olympian and local boy, Adam May (Exploder Ad3), showed the pace over his close rival, the Worlds Fastest Sailor and another local boy, Paul Larsen (Ad3). 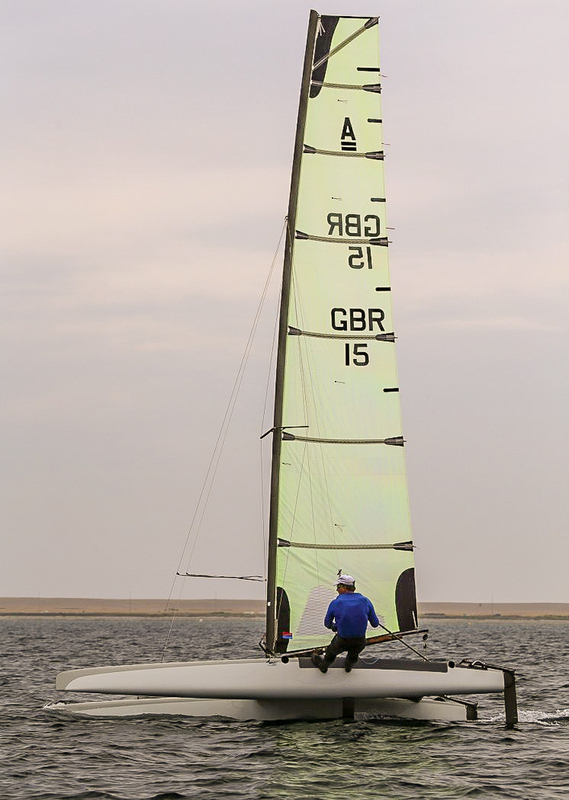 However, it was Adam’s freakish ability to get foiling in ridiculously light winds that gave him 7 bullets in the 8 race series. Both sailors had also helpfully shared their local knowledge of where the wind was best with the rest of the fleet, but they were still pretty uncatchable most of the time. 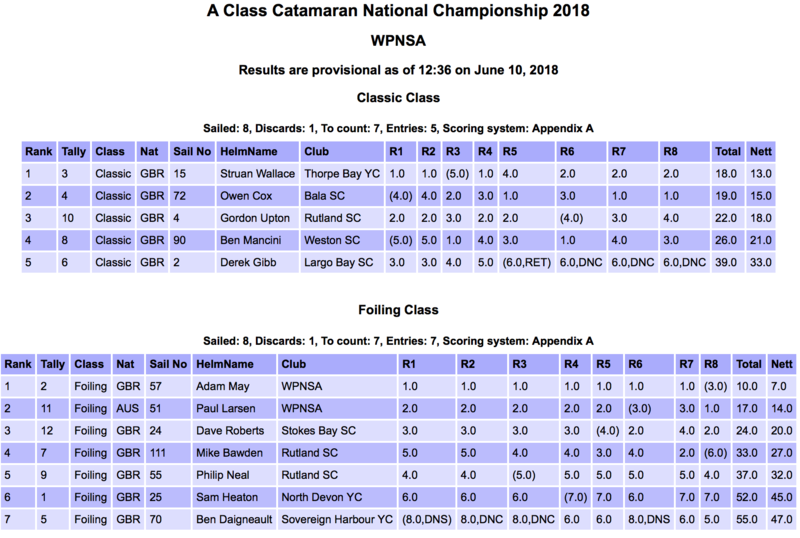 Further down the Foiling fleet, the Stokes Bay sailor Dave Roberts, tried his best to dent their dominance scoring a couple of 2nd places in the process. Next in the running order were the two Rutland sailors Mike Bawden (Ad3) and Phil Neal (Exploder A14). This pair are used to battling against each other week in and week out, so just took the fight to Portland and Mike was the stronger on this occasion. ‘A’ Class newbie, Sam Heaton doggedly battled around the course, refusing to give up but learned some good skills in doing so. He is the perfect example of why all newcomers should enter such events. It would have taken him months to learn what 3 days have taught him here, and the advice given from the other sailors is invaluable. Rounding off the fleet was Ben Daignault (DNA). Ben suffered a major rudder stock failure in race one after a particularly spectacular crowd-pleasing foiling wipeout, so was all ready to go home early. 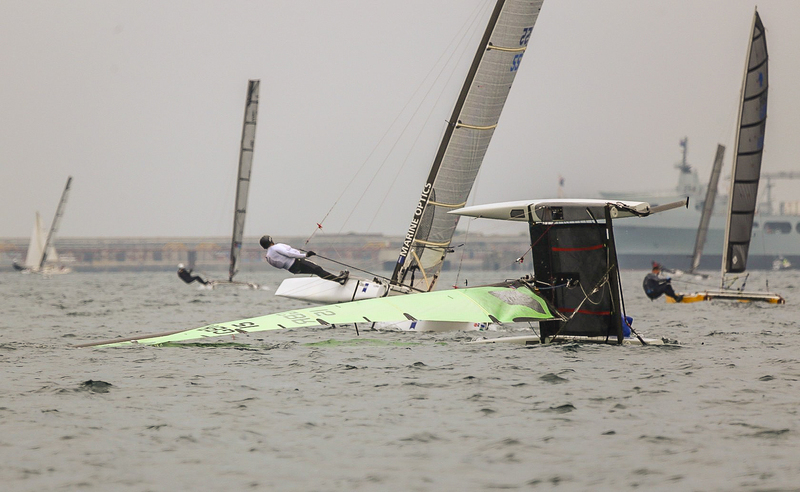 However, Paul Larsen’s legendary Aussie ‘can do’ attitude kicked in, and he got going after the sailing, with carbon, hairdryers and a bin liner and next day Ben was back on the water with a fixed and working case. In the Classic fleet, BACCA President Struan Wallace (Scheurer G5) was usually the fastest in both the windier and lighter stuff. But his inability to consistently remain on the dry side of his boat, even when the boat was behaving itself will be remembered. During race 3, in the light stuff, and having gained a good lead, he somehow just fell off it. He resurfaced to see his boat serenely sailing on downwind, at the perfect angle and just missed the bottom gate. Had he been on the other tack, it would have won all on it’s own, as it would have crossed the finish line rather like a loose horse at the Grand National. Next day he did a similar thing but in more wind and the boat waited for him on it’s side this time. Next down was RSC’s Gordon Upton (DNA), a heavy wind specialist, vs Bala based Owen Cox (Bim XJ), the light wind specialist. Owen scored 2 bullets on the final day to finish 2ndoverall after Gordon struggled to get going with his heavier wind setup. Another good light airs sailor, Ben Mancini (Bim 2000) from Weston, came in 4thoverall after also struggling with mast rake in the windier early races. And welcome ‘A’ Cat returnee and Largo Bay sailor Derek Gibb (Scheurer G5) was 5thafter retiring in race 5 and played no further part in the racing. In the end, despite the lowish turnout, the event was very enjoyable. 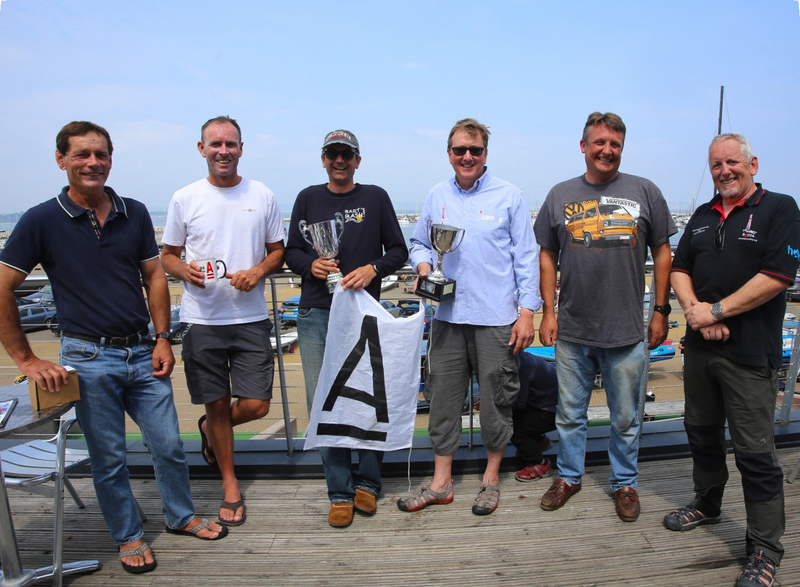 The waters of the WPNSA are as excellent as we had been led to expect, as was the reception from the staff and helpers, who also had to cope with and herd 50 or so excited local kids who were having some Dragon Boat races that weekend too. Now bring on the 2019 ‘A’ Cat Worlds, to with you are all warmly invited and the local cider is being brewed as we speak.